Napa (land oh vines and wines!) which izza just 60 miles North of San Franfuncisco and we San Fran meowsters wazza jolted out of our meowvalous sleep! 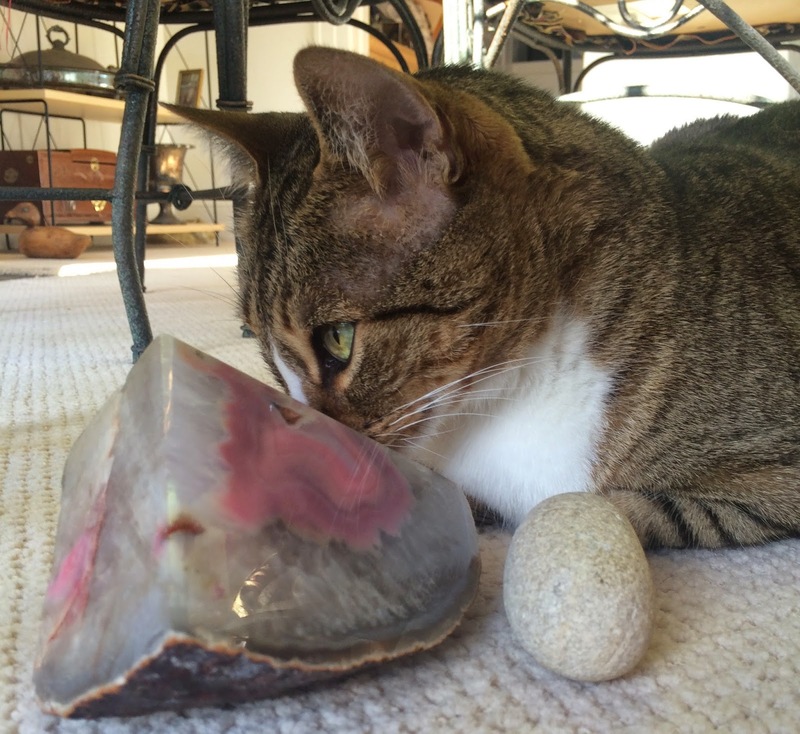 So I am inspectacatting the rocks - yep uh huh cuz weeza rocking in the quake! After inspectacatting the rocks, Me & MYself moved right into being the ROLL Engineer cuz the earth wazza not just rocking but it was ROLLING too and ya gotta be purrrpared for Emergency roll needs. CATZOWEY! After all that work, Me & MYself feels compelled to chillax cuz being on Rocking & Rolling duties during an earthquake in CalEyeFurKneeYah can be exhausting! Wishing you a non CATastrophic week and a week where the ground isn't moving where you live! But do be sure if youza in earthquake land or tornado land or even hurricane land to always have your Emergency Packs for 2-legged AND Anipals refreshed quarterly and ready to go cuz you never ever know when youza gonna need it. CATZOWEY & meowza wowza! AND purrrhaps an ouchie! Someone luvs luvs luvs me so so so much theyza getting a Guido tat! Now this izza first in my 8 years on da Planet! Dontcha wonder why theyza didn't select this pose for the Tat? Well purrhaps cuz their arm not buffed up enough! Yep Uh Huh this pose needs a mighty meowscle and big bicep to tat upon cuz I'ma Man Cat large and in charge. Nowza I tells YOU, if theyza had selected this pic well yep uh huh, theyza definitely could have have my meowster face Tatted on their inky dinky wrist that helps them lift their glass of da Vino. 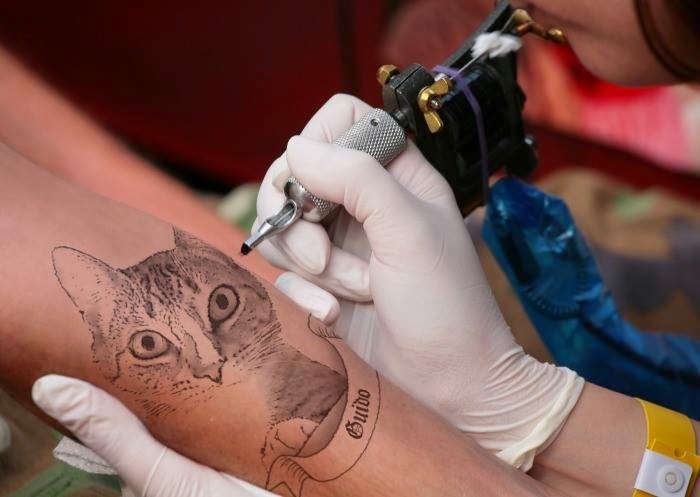 So many pawsabilities for Tats! Pssst .. IF theyza Vegiecats theyza could have had this organicat tomato & Me and MYself tatted on their tummy too. Yep, all in the name of sustainable vegies - dat works for my organicat self. Dontcha thinks this would be purrrfecto for the protein loving person in your life looking for an EGGstaticat healthy kind of purrrOHteen loving Tat! So I hopes YOU tells Me & MYself which pic youza would put on your tat if youza ever gonna do dat. Ratta tat tat weeza into dat fantastical fun on Tuesday. Catzowey! 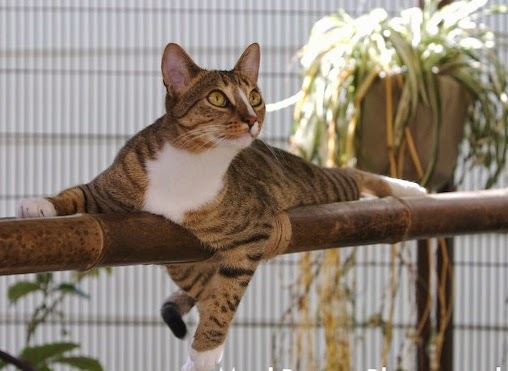 I'm ecstaticat to share pics of Me at MY job in San Franfuncisco. Yep uh huh it's for sure I am purring at work - psssst ... some folks don't like their jobs but Me & MYself do cuz Animal Assisted Therapy rocks more than a Meowgarita Pizza Pie and is more fulfilling than a platter of Pasghetti n' Meatballs ! Catzowey! Me & Myself believes in stretching before the job starts cuz I gotta get limbs limbered kind of like a catzowey downward dog. Bamzatini! I'm on the job feeling purrrfectly relaxed when I looks into my speshule furiend's eyes. 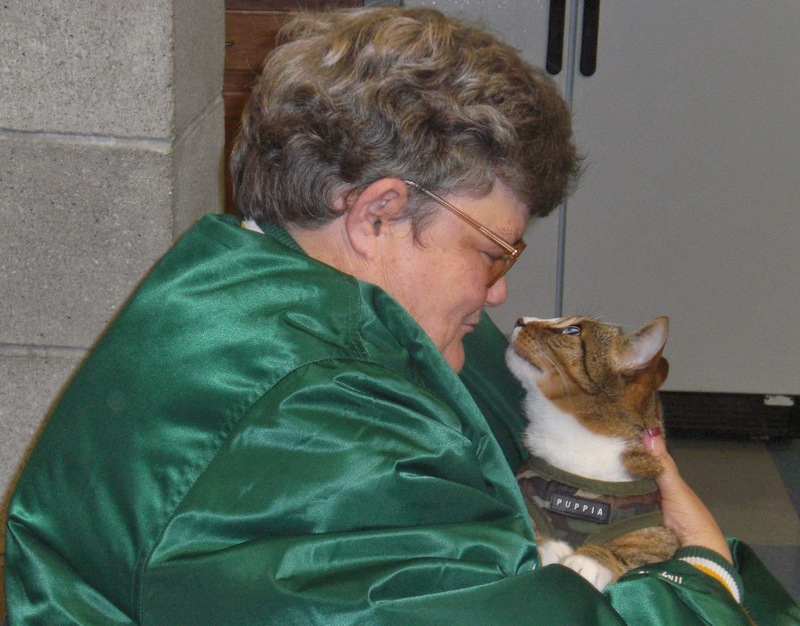 WOWza MEOWza being an Animal Assisted Therapy pet purrrvides ya abundacat kitty kisses and smooches galore and more. Hmmmzatini! Me & MYself knows the power of the purr - yep uh huh itza for sure. And some folks cannot see me but theyza feels my fur and straightens my work Tie, and theyza knows I'm purrrresent. Cuz I'ma EyeTailYun Man Cat on the job doing my Animal Assisted Therapy work. Works for me for sure. IF youza knows someone whooza got patience and paws, check out venues in your local areas to help spread abundacat smiles, purrfecto loud purrs and some doggone great woofzatinis too. Wishing YOU a most nonCATastrophic week! CATZOWEY! Where have my great 8 years gone to since I started being the purring publisher of The Guido Gazette? 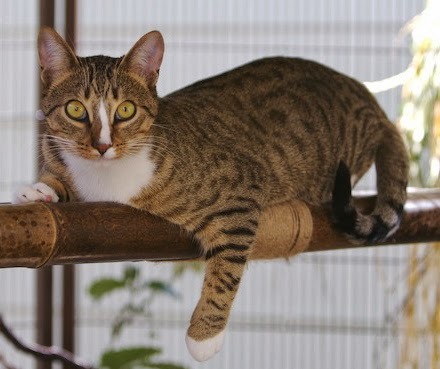 Are you curious as a cat to find out nowza? Get ready for a Catzowey visit down memory lane. August 6, 2006 Me & MYself started at the yungun age supurrrrrvizing stuff & staff while keeping my cat eyes on things in my office. Yep uh huh. I wazza recruited to do the job! Cuz Me & My EyeTailYun kitty self believes in diversity so I had play dates with diverse pals on my office breaks cuz CalEyeFurKneeYah laws says youza gotta takes dat work break AND life is CATZOWEY with diverse furiends. Right on from the startzaloni I began enforcing RECYCLING in my office. HEY I'm the EyeTailYun man cat Boss man so I can make those rules. Paying attenzione at the yungun age to our environment wazza impurrtan to Me & MYself. Like watching the water usage all the time - yep uh huh datza meowvalously impurrtant and I recommend all Staff & friends do the same. 63,540 visitors visiting & 1,482 comments (wowza meowza). The Guido Gazette purrroudly goes global all around the Planet weekly to all Continents - bringing a great message - Start Your Day the GUIDO way like I did EIGHT YEARS AGO! I wanna say MILLE MEOWSTER GRAZIE furiends. I luvs luvs luvs youza!